Switch Grass is a versatile perennial warm season grass native to nearly all of the United States excluding only the Pacific Northwest and California. This grass features a distinctive white patch at the base of the leaf as it attaches to the stem making it easily recognizable. The leaves have a bluish cast that can reach up to 2 feet long. It is a forming sod grass with a round reddish stem. An open spreading panicle helps to identify the seed head. A soil test before seeding is recommended to determine whether phosphorus and potassium are necessary. Nitrogen is not recommended before planting as it may encourage weed growth but may be warranted after it begins to produce. It is best not to add fertilizer to switchgrass since too much fertilizer can harm the plants. If the ground needs fertilizing then add the compost before planting to protect the plants. They also do not need to be treated with pesticides or herbicides since weeds and pest do not pose a threat. The only real danger to switchgrass seedlings is grasshoppers. Dusting with plain, all-purpose flour will deter the grasshoppers without harming the plants. Switchgrass adapts well to differing climates, soils, and rainfall making it ideal for protection against soil erosion. The good thick bed is also perfect for grazing livestock and wildlife. Testing is going on in many areas as to the suitableness for a biofuel source. Burning switchgrass fields every 3 to 5 years will have to stimulate growth as well as control weeds and residue. 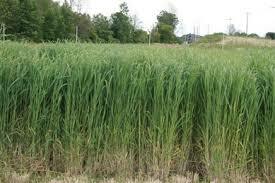 Switchgrass is a deep-rooted perennial plant, native to the tall-grass prairies of North America. It is a real grass, also known by the names tall prairie grass, thatch grass, Wobsqua grass and tall panic grass. It can grow up to 8 feet tall. Farmland has replaced much of its original range. It has multiple uses, including as a source of hay and straw, biomass for energy production, a versatile ground cover, and erosion control mainly because of its deep root system. Switchgrass also provided good habitat and protection for upland game birds such as pheasant, quail, and grouse.